Verdi's production of Aida in early March, 1873 was delayed due to the sudden illness of soprano Teresa Stolz. Verdi focused his time in Naples on the writing of his first chamber work, the String Quartet in E minor. 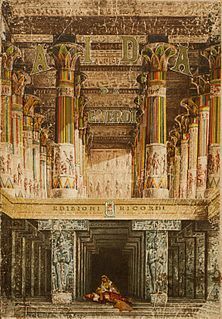 The work was premiered two days after the opening of Aida during an informal recital at his hotel on April 1, 1873. The names of the original performers survive only as Pinto brothers, violins, Salvadore, viola, and Giarritiello, cello. 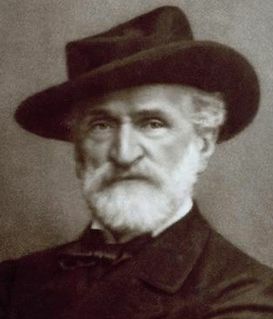 Verdi commented on the work, saying "I've written a Quartet in my leisure moments in Naples. I had it performed one evening in my house, without attaching the least importance to it and without inviting anyone in particular. Only the seven or eight persons who usually come to visit me were present. I don't know whether the Quartet is beautiful or ugly, but I do know that it's a Quartet!" The Quartet is scored for the usual string quartet complement of two violins, viola, and cello. A string quartet is a musical ensemble consisting of four string players – two violin players, a viola player and a cellist – or a piece written to be performed by such a group. The string quartet is one of the most prominent chamber ensembles in classical music, with most major composers, from the mid 18th century onwards, writing string quartets. The viola (; Italian pronunciation: [viˈɔːla]) is a string instrument that is bowed or played with varying techniques. It is slightly larger than a violin and has a lower and deeper sound. Since the 18th century, it has been the middle or alto voice of the violin family, between the violin (which is tuned a perfect fifth above) and the cello (which is tuned an octave below). The strings from low to high are typically tuned to C3, G3, D4, and A4. Max Christian Friedrich Bruch, also known as Max Karl August Bruch, was a German Romantic composer and conductor who wrote over 200 works, including three violin concertos, the first of which has become a staple of the violin repertory. The Takács Quartet is a string quartet, founded in Hungary, and now based in Boulder, Colorado, United States. The Piano Quintet in F minor, Op. 34, by Johannes Brahms was completed during the summer of 1864 and published in 1865. It was dedicated to Her Royal Highness Princess Anna of Hesse. Like most piano quintets composed after Robert Schumann's Piano Quintet (1842), it is written for piano and string quartet. The Kopelman Quartet is a Russian string quartet founded in 2002 by Mikhail Kopelman (violin), Boris Kuschnir (violin), Igor Sulyga (viola) and Mikhail Milman (cello). They studied at the Moscow Conservatory in the 1970s, but pursued individual careers for twenty-five years before founding the quartet. Franz Schubert's final chamber work, the String Quintet in C major is sometimes called the "Cello Quintet" because it is scored for a standard string quartet plus an extra cello instead of the extra viola which is more usual in conventional string quintets. It was composed in 1828 and completed just two months before the composer's death. The first public performance of the piece did not occur until 1850, and publication occurred three years later in 1853. Schubert's only full-fledged string quintet, it has been praised as "sublime" and as possessing "bottomless pathos," and is generally regarded as Schubert's finest chamber work as well as one of the greatest compositions in all chamber music. The Octet in F major, D. 803 was composed by Franz Schubert in March 1824. It was commissioned by the renowned clarinetist Ferdinand Troyer and came from the same period as two of Schubert's other major chamber works, the 'Rosamunde' and 'Death and the Maiden' string quartets. Dmitri Shostakovich's String Quartet No. 1 in C major, Op. 49, was composed in six weeks during the summer of 1938. It carries no dedication. The Divertimento in E-flat major, K. 563, is a string trio, written by Wolfgang Amadeus Mozart in 1788, the year in which he completed his last three symphonies and his "Coronation" Piano Concerto. It is widely regarded as separate from his other divertimenti. The Quintet in A minor for Piano and String Quartet, Op. 84 is a chamber work by Edward Elgar. The String Quintet No. 4 in G minor, K. 516, written by Wolfgang Amadeus Mozart, is like all of Mozart's string quintets a "viola quintet" in that it is scored for string quartet and an extra viola . The mood of the piece is dark and melancholic, typical of Mozart's G minor works. The String Quintet No. 3 in C major, K. 515 was written by Wolfgang Amadeus Mozart. Like all of Mozart's string quintets, it is a "viola quintet" in that it is scored for string quartet and an extra viola. Quintet in E-flat for Piano and Winds, Op. 16, was written by Ludwig van Beethoven in 1796. The six String Quartets, Op. 76 by Joseph Haydn were composed in 1797 or 1798 and dedicated to the Hungarian count Joseph Georg von Erdődy (1754–1824). They form the last complete set of string quartets that Haydn composed. At the time of the commission, Haydn was employed at the court of Prince Nicolaus Esterházy II and was composing the oratorio The Creation as well as Princess Maria Hermenegild Esterházy's annual mass. The String Quintet in C minor, Op. 104, written by Ludwig van Beethoven in 1817, performed on 10 December 1818, and published in 1819, is an arrangement of the early C minor Piano Trio, Op. 1 No. 3. This work is scored for a string quintet with two violas. Richard Henry Walthew, also known as Richard H. Walthew was an English composer and pianist. Lawrence Power is a British violist, born 1977, noted both for solo performances and for chamber music with the Nash Ensemble and Leopold String Trio. The Piano Quartet No. 2 in A major, Op. 26, by Johannes Brahms is scored for piano, violin, viola and cello. It was completed in 1861 and received its premiere in November 1863 by the Hellmesberger Quartet with the composer playing the piano part. It has been especially noted for drawing influence from composer Franz Schubert. Lasting approximately 50 minutes, this quartet is the longest of Brahms's chamber works to perform. The String Quartet in D major is the only string quartet composed by César Franck. The work was written from 1889 to 1890. Berger, Melvin (2001). Guide to Chamber Music. Courier Dover Publications. Parker, Mara E. (2005). String Quartets: A Research and Information Guide. London: Routledge. Streatfeild, Richard Alexander (1895). Masters of Italian Music (PDF). London: Osgood, McIlvaine & Co.
Hyperion Records is an independent British classical record label.